Going Out of Business Sales a Scam or Worthwhile? 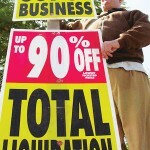 When I drove past the guy dressed as a chicken waiving a sign touting a “Going out of Business Sale” at a local furniture shop for 6 months straight, I started to wonder, “how long does it take for this place to actually go the heck out of business?”. I was also thinking about whether the people that went to the supposed “liquidation sale” in month 1 were getting the same deal as those going in month 6, and whether any of them were really getting a deal at all. Evidently, this phenomena is warranting the attention of lawmakers seeking to curtail such practices which ultimately appear to be a lousy deal for the shoppers – and misleading. According to this recent article, a rug dealership in Atlanta was fined by the Governor’s Office of Consumer Affairs for conducting a going out of business sale that extended 6 months: “consumers are victimized because they end up paying higher prices for merchandise that they believe hasbeen greatly discounted”. During the widely publicized Circuit City going out of business sale, many were calling it the Circuit City Going out of Business Scam. In many cases, rather than marking down prices substantially country wide, consumers found that pricing either varied drastically between stores, the pricing was not discounted at all, or much better pricing could be found at common online retailers like Amazon.com. Consumers going to the sale expecting a discount, were in many cases taken for a ride. Liquidators often try to mask the fact that items are refurbished or previously opened. Sales are usually final – you will have to go through the manufacturer for defects often times, if they honor such a policy. Sale prices tend to be BEST just prior to the start of the liquidation and at the very tail end just before deadline of close. Note that it may be tough to time the pre-liquidation horizon and if you wait until the end, there may not be much good merchandise left. If you have an handheld with web access, it would behoove you to just bring it into the store and comparison shop to see if you’re truly getting the best deal; otherwise have someone waiting by the phone. Incidentally, if you have a Gift Card from a chain that has declared bankruptcy, when you go the the sale with your gift card, you’re out of luck! This article outlines my experience with Bombay after they had just sold a gift card to a relative who in turn gave it to my wife as a gift. Talk about frustrating! I’m interested to hear about your tips and experiences related to Liquidation Sales. Haverhill Home Staging Course – Have You Been Had? Is Shop To Earn a Scam or Legit Business Opportunity? These same company also did the Linens and Things liquidation. At both “sales” the prices were higher than they had been before liquidation started. Bringing my mobile confirmed that most items could be purchased cheaper elsewhere. Another alarming fact is that the liquidation company brings in product just for the liquidation. Taking advantage of the buying frenzy and people assuming that are getting a good deal without researching it. I’m link loving this great article w/i next 48hrs. Finance Junkie’s last blog post..Is an Education Worth the Expense? Watch out for dollarsdirect its a scam!!! You may not even get a good deal even near the end of the bankruptcy sale. Instead they’ll look somewhere else to make a sale where they can still make a significant profit – internet auction sites and foreign countries are prime examples. Your information is correct about the large chain stores. However, liquidation sales done by liquidation companies for them are totally different. 1. My goal is to get the sale done ASAP. Generally, sales are 1-2 months depending on the inventory level. 2. I never raise the prices in the store. Whatever, the price is when I get there, that is the regular. However, some owners will raise prices before I get there, but I have my ways to find out quickly. 3. We don’t bring in inventory for the sale, but suggest to the owner to order a limited quantity of their best sellers before the sale starts. 4. I suggest to the owner the best course of action, but they have the final say. My goal is to make the most for the owner while giving the best deals possible for the consumers. Many of the owners I have dealt with have run their stores for 30-60 years and that is their retirement. The best time to find the best deals is the first day of the new prices. If you wait until half off, the best items will be gone, but plenty of bargains especially on out of season merchandise. The last few days of the sale will sell departments or sections at tremendous values. Just like anything else, if you are nice and reasonable to the liquidator, they are more likely to make a deal with you. I think For those who want purposeful aspect of furniture more important except its visual, secondhand or used office furniture is a smart option for them.